LATEST UPDATE: According to YahooNews the official death toll reached 1,833 on Monday, but the number did not take into account the 2,000 bodies that Japan’s Kyodo News said had been found in the hard-hit Miyagi Prefecture on Japan’s northeast coast. 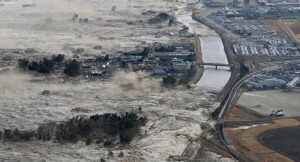 At least 2,369 people were missing on Monday, the National Police Agency said. Meanwhile, the second explosion in two days occurred at the Fukushima Daiichi nuclear power plant. The Japanese have been hit by one of nature’s biggest punches. 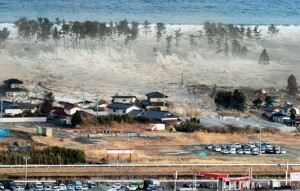 An 8.9 magnitude earthquake, the largest to ever hit Japan, struck Thursday afternoon at 3:00 p.m.causing a 23-foot tsunami wave. Hundreds of people are reported dead or missing as the wave swept away boats, cars and homes while far-reaching fires burned out of control, including at a nuclear power plant. The quake has already been followed by more than 5o aftershocks, many of them reaching a magnitude of 6.0 which have been felt as far away as Tokyo. The resulting tsunami headed toward Hawaii and the U.S. west coast at speeds of up to 620 mph. As far away as Millersville, Pa. is from Japan and Hawaii, a few people in Penn Manor High School are waiting news on the disaster about the conditions and safety of their friends and relatives. Jen Felegi, a senior, has a grandmother, Sumi Okawa who is originally from Japan. She said she checked this morning if her relatives in that country are safe. “Yes, I’ve spoken to my sister. Everyone is okay,” said Okawa, contacted by Penn Points Friday morning. Penn Manor senior Lauren Ressler was waiting to hear about an uncle, Alex Victorino, in the Marine Cops stationed in Japan. Ressler said she was worried about some reports that mentioned a building collapsed near where he is stationed. Later in the day, Ressler got word her uncle, whose daughter attends Hambright Elementary, was not injured in the quake. A few hours later, the tsunami hit Hawaii and warnings covered the Pacific, as far as South America, Canada, Alaska and the entire U.S. West Coast. Waves were predicted to hit the western coast of the United States between 11 a.m. and 11:30 a.m. EST Friday. Evacuations were ordered for parts of Washington and Oregon. All harbors are closed and vessels were being ordered to leave the harbor. She estimated about 100 people were on the beach watching the waves. Stoner said the tsunami was hitting at low tide with a water temperature at about 57 degrees. Despite warnings, she said “people were preparing to swim” in the strong waves. Police said 200-300 bodies were found in the northeastern coastal city of Sendai, near the epicenter of the quake, according to Chron.com. Another 88 were confirmed killed and at least 349 were missing. In Japan, large fishing boats and other sea vessels rode the high waves into the cities, slamming against overpasses and snapping power lines. Upturned and partially submerged vehicles were seen floating in the water and ships anchored in ports are crashing against each other. Train services in northeastern Japan and Tokyo, which normally serve 10 million people a day, were suspended. Tokyo’s Narita airport was closed indefinitely. Residents near a Tokyo Electric Power Company nuclear reactor on Friday were ordered by the government to evacuate because of a possible radiation leak as Japan’s strongest earthquake in over a century shut down power plants and oil refineries. The plant’s system was unable to cool the reactor, although the reactor was not leaking radiation, its core remained hot even after the shut down. The plant is 170 miles northeast of Tokyo according to USATODAY.com. Dave Bender, Honors Earth Science teacher at Penn Manor, said there should be some concern about the fire at the nuclear power plant. The Pacific Tsunami Warning Center said Kauai was the first of the Hawaiian islands to be hit by the tsunami. Water flooded the shore of Honolulu and swamped the beach of Waikiki. Penn Manor student Jing Li took Japanese lessons when she was in China from a teacher who now lives in Tokyo. “I am planning to teach your Friday morning at a regular time, but very bad case, I can not. Right now, we still feel some shakes constantly since 2:45 p.m. (right now after 6 p.m.).and according to the news right now, we may lose some power (electricity) tonight(=our JP lesson time). Officials warned that the waves will continue and could become larger, but a scientist at the tsunami warning center said it didn’t appear that they would cause major damage in Hawaii. “But there is going to be some damage, I’m sure,” said geophysicist Gerard Fryer in Hawaii. it’s a very sad news to here about the earthquake and tsunami…but if all people get together then you can bring a liitle bit of happiness in the life of people who has been affected by the earthquake and tsunami……..